Don’t tell Scott Klein ’90 that life is short. It’s late to say that now. A decade ago in prepared speeches, “because of your generous contributions to the Cystic Fibrosis Foundation,” he was declaring that he hoped to see his first daughter, Alexandra, graduate from high school. Father and daughter will reach that milestone this May. A few years earlier, he had spent 33 months on the waiting list for a double lung transplant. Without the surgery in 2003, he might have had six months to live. His longtime doctor, Chris Landon, recalls Klein training “like an Olympic athlete” not long before the transplant, even as his lungs were failing him: “He was strong, great abdomen, good arm muscles – and blue” because of poor oxygenation. Back in college, if Klein feared death he didn’t show it. When on one day he telephoned his future wife, Gabbi (Walsh ’91), to explain that he would be staying at home for a while “because his lungs had collapsed,” it was the first time she’d felt how serious his disease was. In earlier years, he knew he wasn’t like the other kids in Woodland Hills. His mother would pound on his chest to loosen mucus. He was on medications because his pancreas didn’t work and on other medications to help him breathe. From about age 7 and until the transplant, he inhaled a pharmaceutical cocktail through a nebulizer in the morning and again at night. It was as if he always had a cold, and when he really caught one, the infection would develop into pneumonia or pleurisy. To put it all into perspective: when Klein was born, most kids with cystic fibrosis did not live beyond the age of 2. He was never expected to grow up, and for a long time, he says, growing up was just about the only thing he refused to try. But he managed the feat in the end with help from loved ones, a cheerful disposition, and an unlikely passion for hockey. Ice hockey is the perfect sport if you have a lung disease, says Klein without a hint of irony. (He finds many reasons to laugh in conversation, but not about this.) He liked the pace of hockey, and all the starting and stopping. “I go back to the bench, I cough up the junk and catch my air, and then, boom, I’d be back on,” he said. He started learning the game at the age of 4 in the Topanga Plaza ice rink with a friend who’d moved to Woodland Hills from Minnesota. He played hockey until junior high, gave it up, and then returned to it when a Cal Lutheran club team formed in the late 1980s. Since then, he’s never gone more than a couple of years without playing or officiating. At five-foot-eight and less than 135 pounds in college, Klein took abuse from opponents. “I learned real quickly to hit them first. My attitude was, that got 50 percent of the contact out of the way,” he said. This physical theory failed him on occasion, as it did when a University of Southern California player caught him in mid-air and released him flat on the ice. The following morning, Klein supported himself on one leg in the dormitory shower. Still, he made close, lasting friendships playing hockey, and he felt normal. The sport was a key piece of his strategy of minimizing, if not quite denying, his cystic fibrosis while also “taking in as much life as possible,” as Gabbi Klein puts it. Klein was skilled on the ice. In his best season, in 1989, he was 10th in the league in scoring with 23 goals and had 11 assists, as he recalls the final stats. That March, he was thinking about marking a 20th goal in a game against CSU Northridge when he got the news that his father had died suddenly. Expectations often are false guides to life. They are also the measure of what we experience as shocking. For Klein, two major life events stand out as shocks. First was the death of his father at 54, made doubly hard because he’d never been prepared to see the day come. Klein was 20. On the following day, his teammates were surprised to see him in the locker room. He’d decided to play and to dedicate the game to his father. Some of his closest friends from both high school and college were there to support him. As he’d intended, he put his 20th goal for the season into the net. “I remember I scored in the first period, and then I was on the bench. Then I lost it. It was hard to continue playing,” he said. The other big shock of Klein’s life would come at age 35 after his double lung transplant – because the 11-hour surgery was a total success. Klein, who had been admitted to the hospital three or four times a year roughly since his 6-year-old daughter was born, woke up after surgery to discover that his oxygenation was at 100 percent for “the first time in my life.” Doctors had not needed to induce a coma, and he would not need a ventilator. With his leg muscles recovering from atrophy, Klein started training on the ice just three months after the surgery. He felt great. As Dr. Landon observes, this was in spite of the fact that his body was trying to fight the new lungs. About a quarter of patients die within six months of a lung transplant and about half of them within three years. To stay healthy, Klein has relied on his strength of will and anti-rejection medications. A diabetic, Klein also takes insulin shots every day to regulate his blood sugar. But he says his health is good. He’s made so much progress there and, he insists, still greater progress in his personal development. Before his surgery, he had earned an MBA and started work as an accountant in Valencia. He’s an inch taller now than in his college days and is happy to have gained some weight as a side effect of medication. 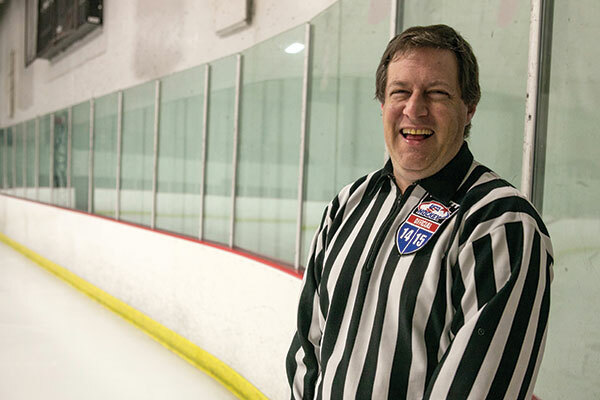 His side job as an ice hockey referee for Southern California Amateur Hockey Association adult games keeps him in shape. Which is good, because he and Gabbi now have two daughters. Klein wasn’t expected to have most of his roles in life: student, team member, husband, father. In a strong sense, he chose them. He now hopes to see his daughter Isabella graduate from high school 12 years from May.